VBAN Receptor getting Overload (mostly) and sometimes Underrun. 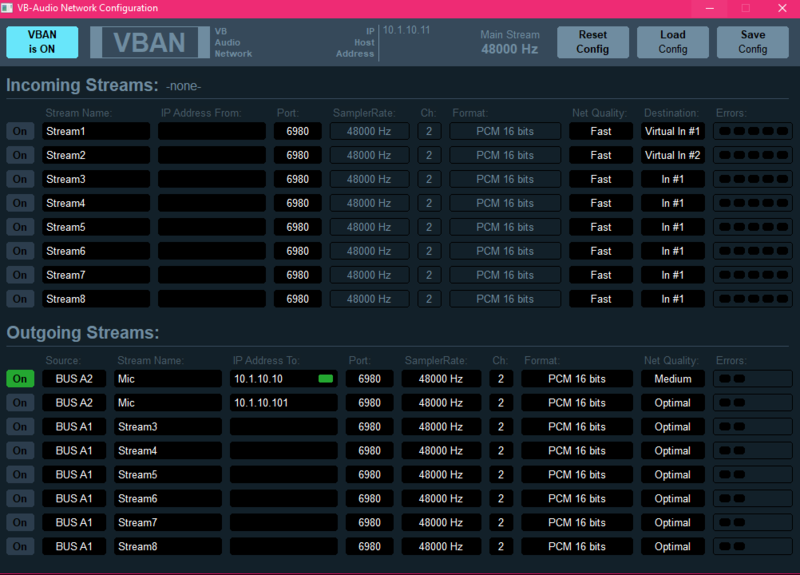 I'm streaming audio from one PC to another, with VB Banana on the sender and VBAN Receptor on the receiver. Both are latest updates of Win10 on a home network with both plugged into a 10/100 Netgear switch. Things are fine, for awhile. However, after about 20 minutes (and sometimes as long as a couple hours), Overload starts lighting up non-stop (and sometimes Underrun, too, but not as often). I initially used Optimal network on sender and receiver. Dropped it down to Medium and even Very Slow on receptor to see if it behaved differently, but it didn't. Still eventually shows Overload after awhile (in the most recent case, after 30 minutes). I then set up a second stream from VB Meeter to the VBAN Receptor ipad app and (even using Optimal network), it almost never showed any Overrun or Underrun (and certainly not non-stop like on the other PC). The result, of course, is that the audio becomes choppy, stuttered, robotic, etc. 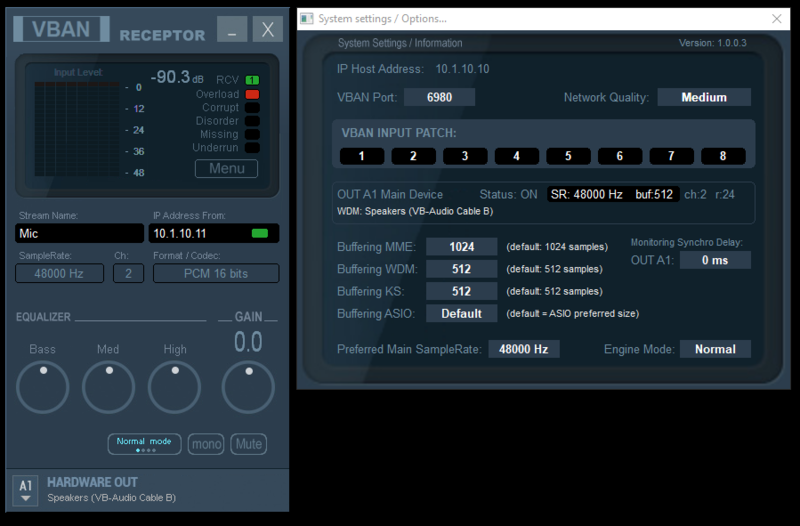 I have attached a screenshot from Receptor and VB Meeter, both. (Also, a secondary question -- is there a way to issue a "restart audio engine" from the command line?). Re: VBAN Receptor getting Overload (mostly) and sometimes Underrun. this kind of unstability appearing after some hours are usually due to main device (selected as output A1). 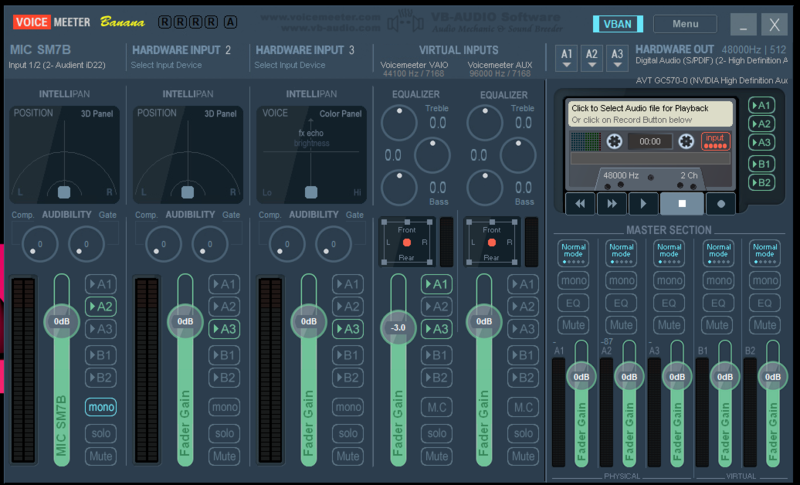 on Voicemeeter Side or on Receptor side (you are not expected to select a VB-CABLE as main output device, but Physical Device). Keep default settings (default buffer size / default engine mode) and select your best audio device as output A1 (giving the main stream): ASIO device if present (with 256 or 512 sample buffer size) … WDM or KS (512 sample buffer size) … MME as last choice (512-1024 sample buffer size). In all cases you must test it on significant duration to validate your configuration before going on air.